Violinist Michelle Abraham was appointed Associate Concertmaster of the Tucson Symphony Orchestra in 2016. She is the former concertmaster of the Ashland Symphony Orchestra in Ohio, and served as guest concertmaster of the Suburban Symphony Orchestra in Cleveland. In recital, Michelle collaborates with pianists Peter Takács (Oberlin Conservatory) and Shuai Wang (Cleveland Institute of Music), and University of Arizona Professor of Violin Timothy Kantor. 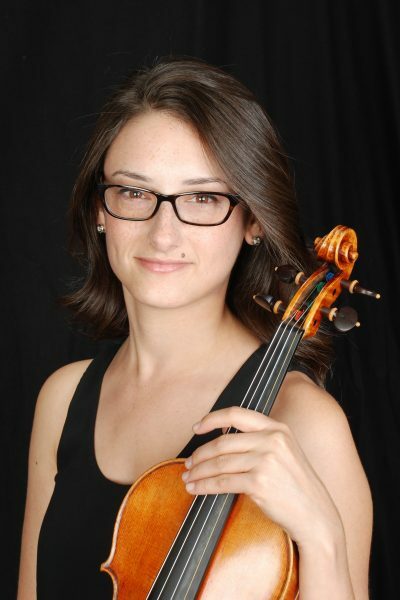 She has appeared as guest artist on Faculty Chamber Music Series at Oberlin Conservatory, Dana School of Music at Youngstown State University, and Fred Fox School of Music at the University of Arizona, as well as the Arizona Friends of Chamber Music Summer Series and Saint Andrews Bach Society in Tucson. Deeply committed to music education, Michelle teaches Suzuki and Traditional violin students ages 3 and up in her home studio in Tucson, AZ, and is on the Senior Session Violin Faculty at the Kinhaven Music School in Weston, Vermont. She has taught at The Music Settlement and the Oberlin Community Music School in Ohio, and taught and coached chamber music for several summers at the New England Music Camp in Maine where she founded their Intensive String Quartet program. Michelle has led Teaching Workshops to music students at the University of Arizona, and has presented educational chamber music programs in the Cleveland Public Schools as well as in the Banff and Bow Valley Communities in Alberta, Canada. As a member of the Tucson Symphony Orchestra String Quartet, Michelle presents Music In Schools programs and quartet recitals across Southern Arizona. Michelle holds a Bachelor of Arts from Stony Brook University, a Master of Music from the Yale School of Music, and an Artist Diploma from the Cleveland Institute of Music, studying with Philip Setzer of the Emerson String Quartet, Pamela Frank, Ani Kavafian, and Paul Kantor. A Connecticut native, Michelle enjoys baking, watching basketball, and spending time with pets Seppe and Ella.